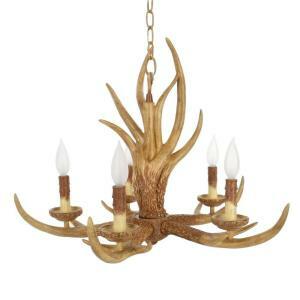 Impart rustic charm to your decor with the Hampton Bay 5-Light Hanging Natural Antler Chandelier. The natural antler finish and authentic-looking antler horns bring the outdoors inside and give your kitchen, dining room or dining nook bright illumination and a truly unique look. Easy to install, this candelabra-stylized chandelier is also easy to coordinate with other pieces from the Natural Antler Collection for a stylish decor theme throughout your home. Perfect for a mountain cabin or lake house. Adjustable hanging length up to 79.375 in. Need help finding the right chandelier for your space? Check out our helpful chandeliers buying guide. Home territory searches the web to find the best prices and availability on Chandeliers and related products foir your home like Hampton Bay 5-Light Natural Antler Hanging Chandelier. For this page, related items include products we find that match the following keywords: "Chandelier" at our vendor partner Home Depot. Hampton Bay 5-Light Natural Antler Hanging Chandelier is one of 84 Chandeliers and related products available for sale through HomeTerritory.com, If you have any questions on this product, please give us a call at 734-971-1210 during the hours of 9am - 5pm EST for assistance. Thank you for shopping at Home Territory, the home furnishings superstore!